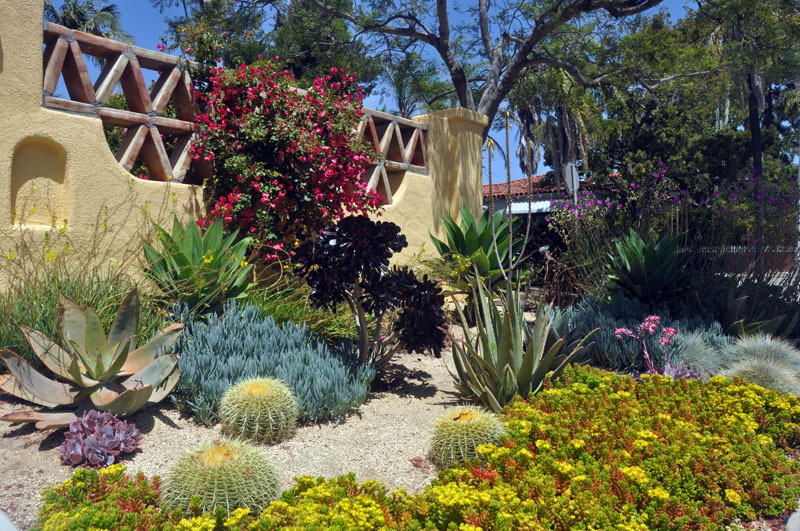 Letz Design Landscape offers expertise on Water Wise Landscape Design and Xeriscapes in San Diego. 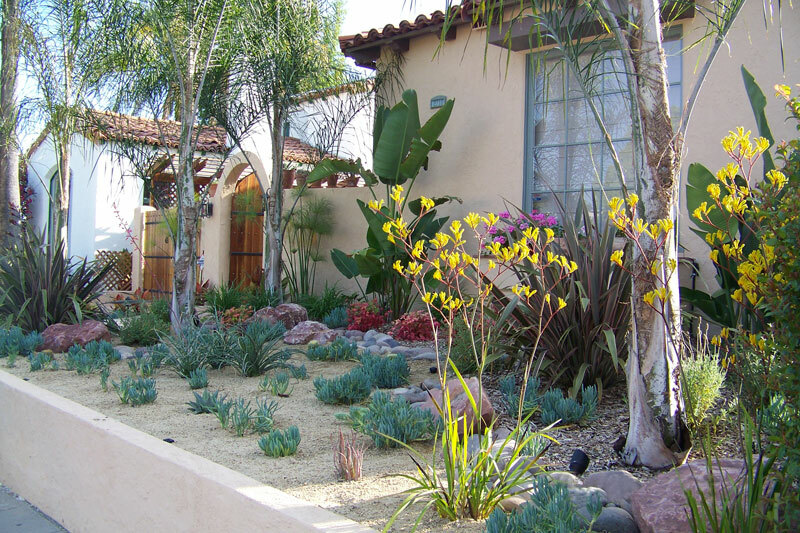 Water Wise Landscapes (Xeriscape) & California Natives conserve water, use natural materials and are sustainable by nature. Xericscapes have 7 principles to follow. Foremost is the careful planning and design of an overall area. Next is improving the soil with organic matter to hold more moisture. Practical turf management, whether using minimal turf areas, low water turf varieties (i.e. Buffalo Grass), or even artificial turf. Appropriate plant selection is key utilizing plants that have fewer problems, less stressors, for a more successful outcome over time. Efficient irrigation practices, such as “smart systems” that recognize moisture content or drip systems which lessen evaporation. The use of mulches, both organic (compost, wood chips, bark, etc.) or others such as gravels, cobbles or decomposed granite. And finally, the appropriate use of on-going maintenance of the garden is to ensure long term health and appearance. Most lawns receive twice the water that is needed to sustain them. Many plants don’t require the same amount of water once they become established, which can be as long as two years. Every garden has its own microclimates as taller plants create shade for smaller plants below them. 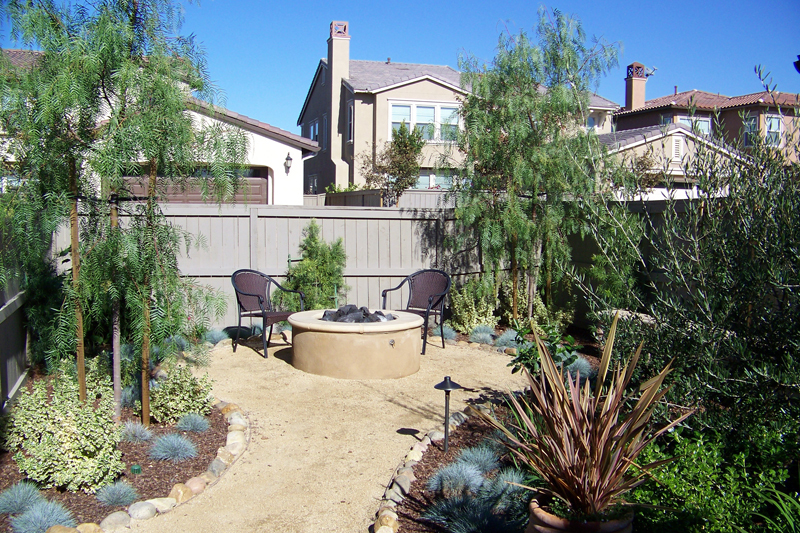 Plants do need to be grouped in specific areas with the same watering needs. Native Plants are resistance to drought. 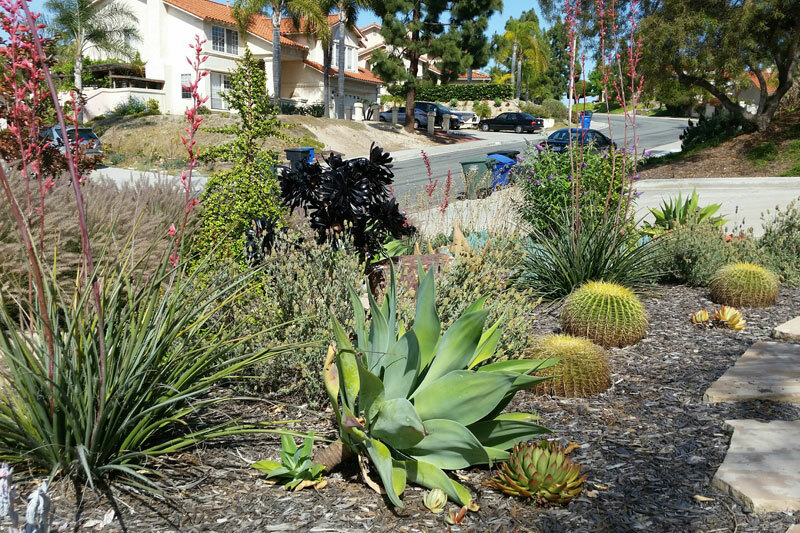 These plants rest during the heat of the summer months in San Diego. Certain plant varieties have evolved over time to withstand our elements with tenacious root systems or modified leaves in shapes ranging from needle like, scales, leathery, filigree, waxy or fleshy. Some plants have a silver appearance due to hair like elements which reduce transpiration and save water. Careful selection is vital to the success of a Native garden. The thought and planning at the beginning will minimize the risk and upset as well as the disappointment and expense later with an ill conceived native garden. 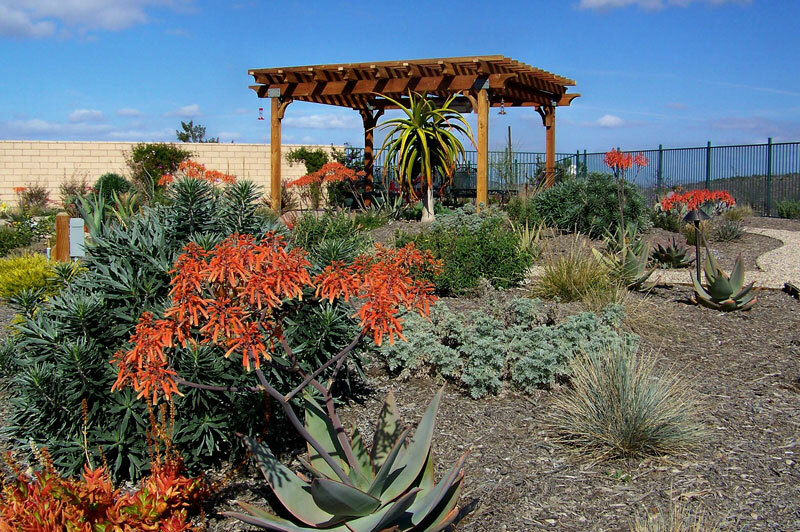 Examples of common native plants to the San Diego region are California Poppy, Shaw Agave, Manzanita, Calliandras or Fairy Dusters, California Lilac, Buckwheat, Sages, and California Fuschia. 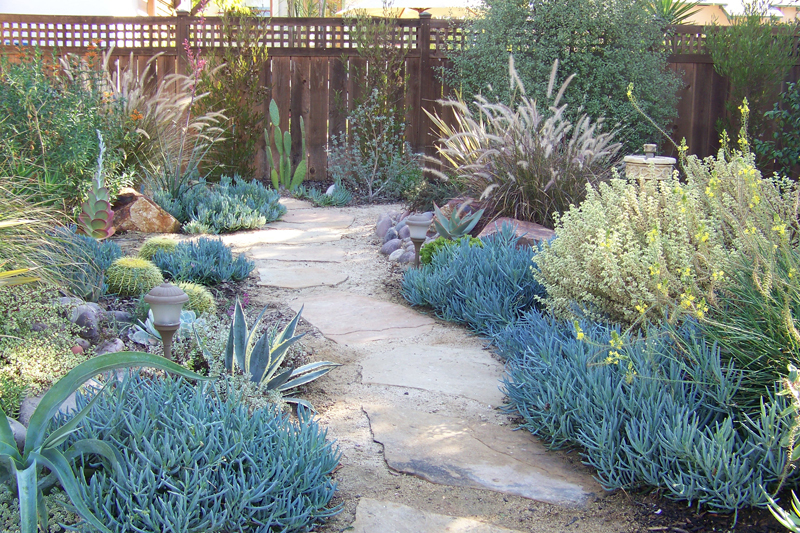 Other Xeric plants may include Rosemary, Juniper, Pittosporum, Achillea, Artemisia, Rockroses, Ornamental Grasses and a multitude of succulent species. 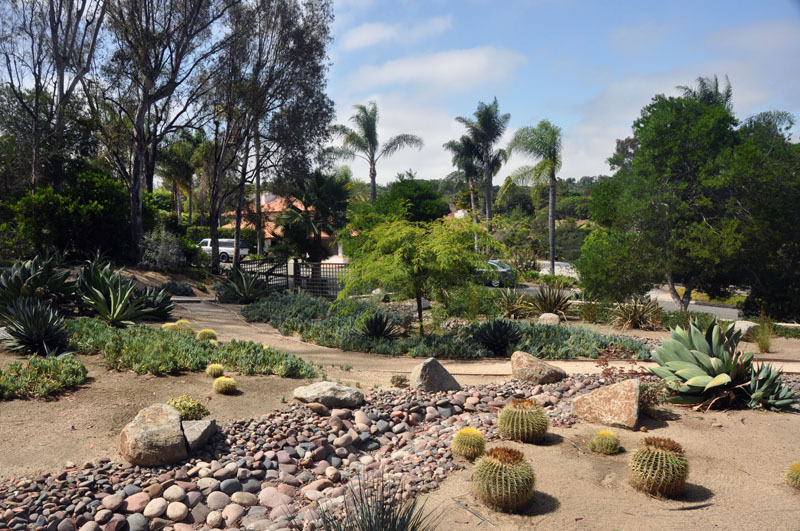 With future water rationing and a growing responsibility to conserve our resources, San Diego and Southern California are now realizing the benefits and potentials of this type of gardening. Dry gardens do have a great ability to be extremely pleasing visually and attract wildlife too. 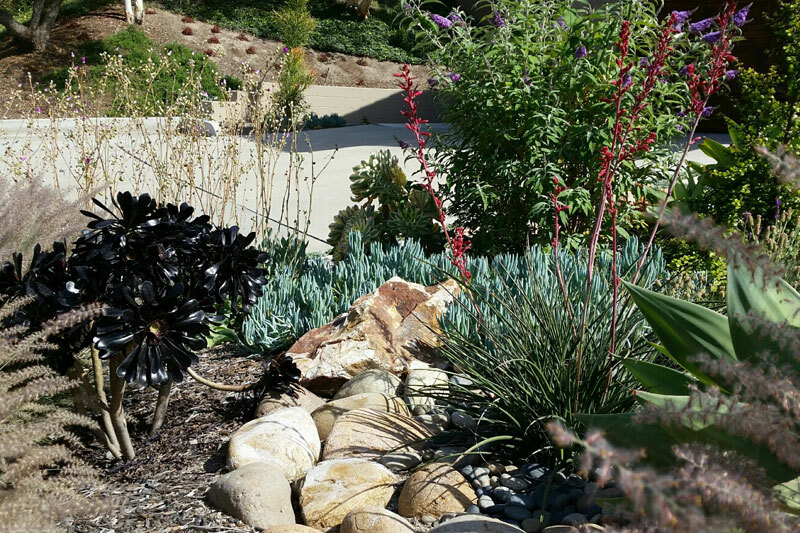 Water Wise Landscapes (Xeriscape) & California Natives conserve water, use natural materials and are sustainable by nature. The term, Xeriscape was coined in Denver in 1970. Xeros is Greek, meaning "dry."